The scent of pine in the air and a sense of quiet come together to create a calming atmosphere at Casa Bou, a relaxing retreat in the Formentera countryside. Newly refurbished for 2017, this rural idyll is located in an area of tranquility, close to the beach of Cala Saona. It boasts privacy and convenience, making it a perfect holiday nest for couples or small families. Casa Bou has a lovely airy feeling, thanks to the neutral decor throughout. It boasts an open plan living room, and fully equipped kitchen with nespresso machine. There are 3 bedrooms, 1 of which is a studio and includes a kitchenette and bathroom that can be separated from the rest of the house if need be. The house has 2 bathrooms, and Air conditioning throughout. Casa Bou has been renovated for the summer of 2017 and is furnished in a simple Formentera style, having a similar interior design to Can Blanca. Sleeps a maximum of 6 people and a baby. With lovely views over the fields and forest, Casa Bou is a great place to relax, eat al Fresco on the terrace and enjoy cooking on the outdoor bbq. This house has a restaurant & local shop just 150 metres away. You can cycle 2km to the beach of Cala Saona or 3 minutes by car. Hire a kayak or boat in Cala Saona, go walking along the cliff tops to the torre la Gavina and enjoy amazing sea views towards Ibiza. Enjoy a snack or drink at the local beach bar or dine in the restaurants overlooking the beach. 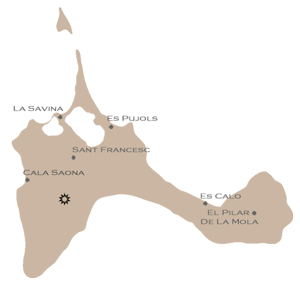 San Francesc is 5 minute drive for all other amenities including banks, post office, shops & more restaurants.